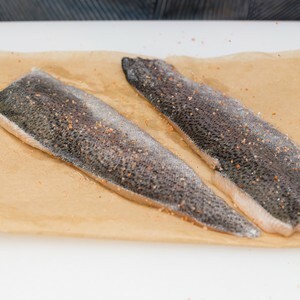 A fillet cut of trout, a freshwater fish commonly enjoyed in the eastern and southern regions of the U.S.
Trout is an extremely versatile fish to prepare. Its pale pink flesh is firm enough to be sauteed, pan roasted, pan fried, poached, grilled, and even smoked, and is delicate and flaky on the palate. Trout is classified as an oily fish (along with salmon and tuna). Despite how that sounds, oily fish are considered to be more heart-healthy than other fish because of a high presence of omega-3 fatty acids. Oily fish are also considered to help prevent dementia. Trout tend to be a bony fish, though prepared fillets are boneless. Trout is a mild and earthy flavored fish that still shines with heavier flavor accompaniments.